Webinar given by ESC’s Ron Bell on How Safe Is Safe Enough?, delivered to the IChemE in January 2017. 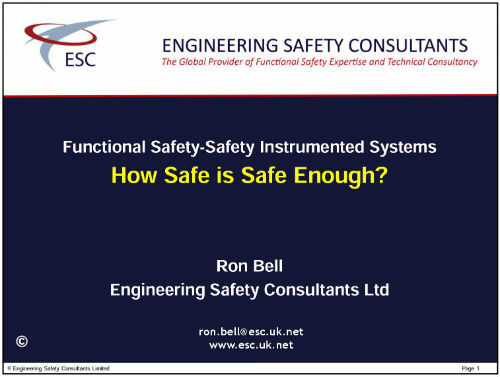 This video recorded from the webinar sets out the key elements that form the foundation for determining what is deemed safe in the context of Safety Instrumented System (SIS) in order to judge how safe is ‘safe enough’? The video sets out an accepted good practice approach to undertaking an ALARP demonstration which is a fundamental to meeting the legal requirements concerning acceptable levels of safety. A simple example of Cost Benefit Analysis is considered in the context of a specific scenario.